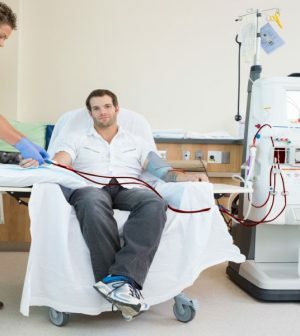 When kidney failure patients undergoing treatment at dialysis clinics suffer cardiac arrest, the clinic staff usually jumps in to perform lifesaving CPR, but not always, a new study finds. “It is reassuring that bystander CPR was associated with improved outcomes in dialysis clinics just as it is in other settings, but it is concerning that the rate of dialysis staff-initiated CPR isn’t closer to 100 percent, considering that all staff should be CPR-trained,” said study author Dr. Patrick Pun, from Duke University, in Durham, N.C.
For the study, Pun’s team examined the cases of 398 kidney failure patients who suffered cardiac arrest at outpatient dialysis clinics in the southeastern United States between 2010 and 2016. The study did not include patients with “do not resuscitate” orders. “Further research is needed to understand what barriers to providing CPR exist in the unique environment of the dialysis clinic in order to improve CPR delivery to patients,” Pun said in the news release.